Francis Ford Coppola Winery is unique among California wineries in its approach to the visitor experience. You might get the first clue from the website, where you'll see pictures of a swimming pool, a performance calendar and a guide to Winery Park. Don't get the wrong idea from all of that - the word "winery" is part of the place's name, and they produce some very drinkable wines, from the affordable Rosso and Bianco to their top-of-the-line Archimedes. You can taste them in a traditional tasting room setting or enjoy them with a meal, but that's only part of what you can do at the place that's shaping what Sunset magazine calls a new cultural trend. After buying the former Chateau Souverain winery in 2006, Coppola took inspiration from Copenhagen's Tivoli Gardens and other classic places of amusement to create something different. Not only is it a new home for his wine-making enterprise, but it's also a place for the whole family to enjoy. Reached via a grand staircase from the parking area, the visitor center occupies a two-story building that houses the tasting room and Rustic, a restaurant with a gorgeous patio overlooking nearby vineyards and serving good food. There's a traditional wine-tasting bar, and they offer tours. On selected dates, the Tasting in the Dark tour offers a chance to experience wine's flavor by tasting it in a dark room. This place would be fun enough if that were all, but it's only a starter. If you veer to the right when you arrive, you might think this isn't a winery at all. To many visitors' surprise, its 3,600-square-foot swimming pool is open to the public. It's surrounded by umbrella-shaded lounge chairs set against a backdrop of European-style changing rooms that look like they dropped right in off the Riviera. It's custom-made for a relaxing day of family fun, fueled by food from the Pool Cafe served right to your chaise or an all-adult respite turned mellow with a glass or two of Coppola's signature wines. During our visit, we jotted down some words that describe the experience. Rather than writing a long, rambling narrative that tries to use them all, we'll just share them with you: "big ol' pool party," "resort," "cruise ship," "straw hats," "mellow," "music." By the end of the afternoon, we were so relaxed that we felt like we'd been on a week's vacation. If you're love movies or are a fan of Coppola's films, he also uses the winery to share his memorabilia. Among the objects on display are a Tucker car, Don Corleone's desk from The Godfather, Coppola's 5 Academy Awards and a host of other interesting mementos from some great films. Instead of being crammed into in one area like a stuffy museum, they're placed more like they might be in a person's home, in cases located throughout the visitor center. Keep looking - and don't forget to go upstairs, too. Their wines are good, drinkable, great with food and excellent value for money, but this place isn't focused on winning awards or racking up points. That doesn't keep some reviewers from saying that Coppola's wines are as good as his films, but think of it as a place to enjoy yourself and have some good food and wine, the perfect day out. I love the sense of fun at Francis Ford Coppola Winery. Unique among California wineries, it's a place where you can spend a whole day eating, tasting and getting away from everyday life. Even if you don't get wet, an afternoon spent lazing around by the pool is uber-relaxing and if you've got a family, it has enough things to do to create an enjoyable day out for everyone. 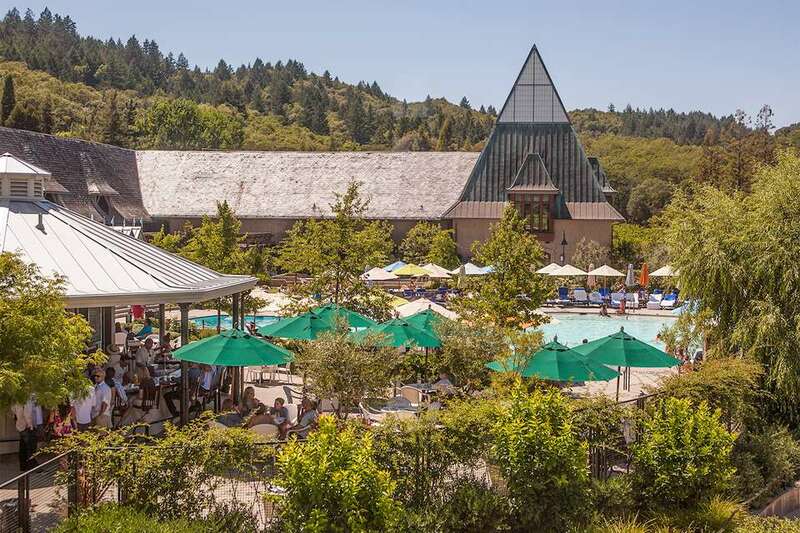 If you think wine-tasting is a serious pursuit that should be done in hushed tones and using coded language, you may find the casual atmosphere at Coppola a bit off-putting. If you're like a lot of the rest of us and want to have a fun day out that includes some good food and wine. If you enjoy a good glass of wine but don't usually think of visiting a winery. And especially if you have children with you, Francis Ford Coppola Winery could be just the place for you. Online reviewers have varying opinions about the Coppola Winery. Those who rate it highest talk about how beautiful it is and often mention the movie memorabilia. It gets lower ratings from people who are looking for a traditional wine-tasting experience. It gets 4 stars out of 5 at Yelp, which includes visitors who only went to the restaurant. Pool passes are limited and we found them sold out shortly before noon on a sunny July Sunday. Your best bet to avoid disappointment is to get there early. Check their current hours. If you find them full up, you can get on a waiting list, but we wouldn't count on anyone leaving this place early enough for you to get in. You can also ensure pool access by reserving a cabine. It's a private place to change, shower and stow your stuff. Lifeguards are on duty and the pool access fee includes use of an over-sized towel for the day. Coppola Winery is unable to invite pets inside the winery gates, including the pool area, exception for service animals. The parking lot is not shaded and no place to leave a pet. You'll be best off to leave Fido at home. Getting to Francis Ford Coppola Winery is easy. From US Hwy 101, take exit 509 toward Independence Lane. The winery is easy to see and just west of the highway. As is common in the travel industry, the writer was provided with a complimentary tour for the purpose of reviewing Francis Ford Coppola Winery. While it has not influenced this review, TripSavvy.com believes in full disclosure of all potential conflicts of interest.